I remember the first time I tried the cakes from this bakery, I felt like Augustus from Charlie and the Chocolate Factory. A piece in each hand, just waiting to refill the enraptured mouth as earlier pieces made their journey down the gullet. The cakes aren't fancy, honestly. Just so light, and so wonderously unctuous. And as someone pointed out the other day: REAL. Fresh cream in between layers of sponge, as opposed to heavy mousse over a base layer of sponge or nut crumble. To me it's traditional cake, and I feel sorry that it's oftentimes passed over these days in favour of more fancy, mousse alternatives. But I am among the guilty as well, so in an effort to make up for lost time, I trooped down to Ang Mo Kio the other night and picked out six different varieties to take home. And among the finalists were, clockwise from the upper lefthand corner: triple layer chocolate cake (nice rich chocolate, yum), peanut roll (2 yums), lychee martini (not what you'd expect, very delicately balanced, also 2 yums), vanilla cream (surprisingly not very good, 1/2 yum) and orange chocolate slice (the orange essence doesn't come across so well, they would've done better using real orange juice, but yum). 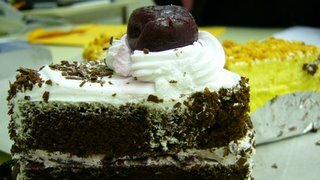 But my favourite here is the blackforest cake (not in picture). Because every component takes its place quite amicably: the cherries though soaked in rum are not overpowering, the cream, fresh but not heavy, and the sponge, chocolatey and not dense. Winner with 3 yums! And by the way, each slice only costs S$2 (US$1.20) on average, a kilo-cake costs about S$30 (US$18) and for an extra S$10 (US$6), they'll deliver any amount to your doorstep. Now is that a great deal or what?! i think that someone should make the real old fashioned butter cake with a thick layer of butter icing in between - the old coffee shop variety which one could buy for 10 cts max in the sixties. that together with a cup of coffee with condensed milk would be heaven. the ang mo kio pine garden varieties come close to ze ol' ones. yes i had similar experiences twice on the phone with the crew at pine garden. they could do with some service classes. Does your blog hаve a сontact pagе? I'm having trouble locating it but, I'd liκe to shoot уou an еmail. Regarding the average time to get pregnant at this age group, it may take up to 7 months or one year. This ensures that the mother will experience a healthy pregnancy. So, pregnancy miracle methods relate unique causes to explain the infertility of an individual.